Can anyone suggest me a good earphone under 20$ in which i can take benefit of high res audio and has good bass. Moved from the wrong thread in the wrong forum. Depends on what you mean by good. 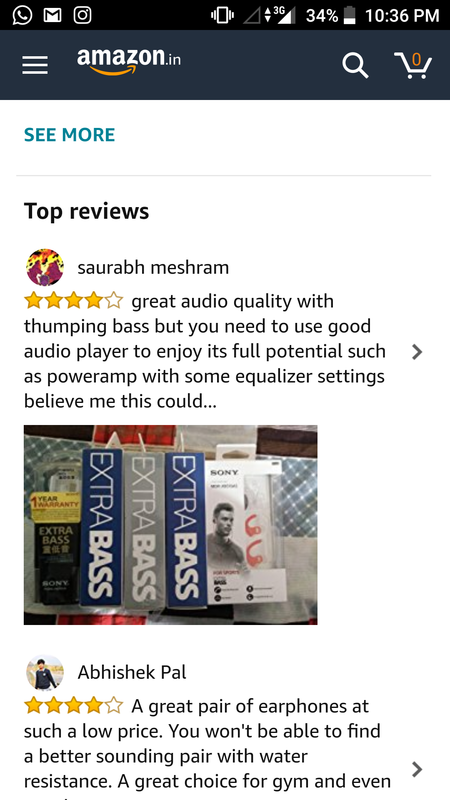 At my understanding, from good earphones. You will not find anything in the price range. Because there is nothing in the price range that I would call good. I've moved this conversation out of the Poweramp v3 updates thread, no idea why it was posted there in the first place. Check these or if ur budget is lower. Go for this. Ikr should have added it somewhere else ? Personally I don't like headphones that go right inside the ear canal, I prefer ones that are more flush to the edge of the ear and only project a little bit inside. Especially when listening at night, so I can lie with the side of my head on the pillow and not have the headset pushing into my ear. Any suggestions for something a bit better sounding than the generic Samsung ones that I tend to use at night (https://www.amazon.co.uk/gp/product/B00ZLTBXSS/) but with the same general form factor, and three-button? Thanks everyone for suggesting me earphones. Hey andre did you find anything relating to Samsung ones? Nope, still using the generic ones at night. To be honest, I have them so quiet and fall asleep within 10 minutes anyway, that it's probably not worth spending a lot on. How's the bass and treble in these? I bought sony xb55 but i think the treble is just too much and after using them for about an hour i feel discomfort in ears (i can still return them). I had lg earphones earlier they came with my phone but they are worn out that's why I'm looking for new ones. Well they are nothing to write home about, but they sound fair enough for £3 manufacturer-supplied earbuds. The sound doesn't hurt my ears anyway, and I use them mainly for the form-factor. Is it possible to make this thread more visible to get more suggestions? Probably better to post it on an audiophile or music hardware forum then, rather than a support forum for a music app.